Another thing I love about board games is that you can learn while playing them. Sometimes it can be genuinely interesting facts, other times it’s just putting your game into gear while you work out an incoming move. Ultimately though, you’re always thinking, often learning and always having fun. Take the rather excellent Memoir 44 for example. It’s a genuinely superb board game from Days Of Wonder that reenacts key scenes from the second world war. The manual has a huge number of different scenarios, but the original information about those events are also included. Without realising it you’re soaking up world war 2 history without even realising it. Wrath Of Ashardalon is a lite version of Dungeons & Dragons, but it still teaches you (indirectly admittedly) about fundamental mechanics of the original game, ensuring you’ll have a better idea of play mechanics if you ever step up to a proper RPG night. Tales Of The Arabian Nights is another great example because it teaches you about some of the most famous stories ever told. Admittedly there’s not as much solid information as with Memoir, but it’s a surprising jumping off point, while the included books contain plenty of snatches of information about the famous tales. Ticket To Ride Europe has done wonders for my daughters’ geography, Wildlife Adventure teaches the importance of endangered animals, while Powergrid has been useful for understanding where some of America’s biggest cities are. And then there are the game mecahnics themselves that require a good memory, and numerous maths solving to solve. I get a real kick when I play games like Agricola and Lords Of Waterdeep with my 11-year old, as you can almost see the cogs whirring around her head, as she mentally works out her next few moves. Board games are soon as boring and stuff, but they are anything but, even more traditional ones like Monopoly, Scrabble and Trivial Pursuit can genuinly help a number of everyday skills. So next time you sit down for a game of something, have a think about what you’ve just played. 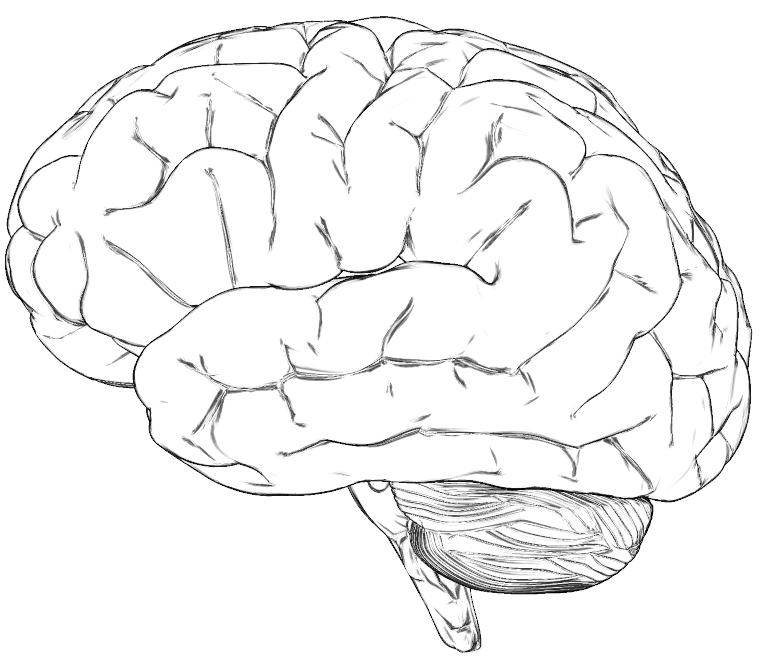 Odds are you might have learnt something that will stay with you forever. There are a number of new games released this week. Kingdom Builder: Nomads is the first expansion for the popular gateway game. It features 4 new boards, 4 new powers, 3 new scoring cards and the all-important addition of a 5th player. Kairo is a trading game which sees players competing for the most lavish stalls. Discover India is a collection game for the family and utilises a tile-based system. Startrek Expeditions Expansion Set One introduces Scotty, Sulu and and Chekov and adds a brand new mission. Bomber Command reenacts key scenes from World War 2 and features plenty of night time raid attacks. All games are currently available to buy from the always excellent Board Game Guru . Wizards Of The Coast has made great in-roads, by transferring its popular D&D brand to board games in recent years. This latest addition is the bravest yet though, and sees the publisher well outside its comfort zone, with a worker placement title which is a world away from the excellent dungeon crawlers it has been delivering recently. Waterdeep, for those that don’t know, is a huge city based in the fictional Forgotten Realms settings, a D&D universe I used to love playing in a good decade or so ago when I still had a weekly Dungeons & Dragons group that I could attend. It’s a place of splendour, mystery and intrigue and is ripe for a board game adaptation, mainly because there’s so much going on in the city itself. No doubt inspired by the treachery and intrigue found in A Game Of Thrones, Wizards Lords Of Waterdeep replicates this intrigue to a point, by placing you as one of the shadowly 11 lords that rule the city (many of them rule in private, with most city dwellers having no idea who they are). Each Lord has access to a number of agents (four in a two-player gamer, to just two in a four and five player game). The lords themselves are the gamebreakers, as they each have specific win conditions (similar to Anky Morpork, but better in my opinion, because every single one is different). Larissa Neathal earns you 6 victory points for every building you own, Nymara Scheiron scores you 4 points for every commerce and skullduggery quest you complete and so on. 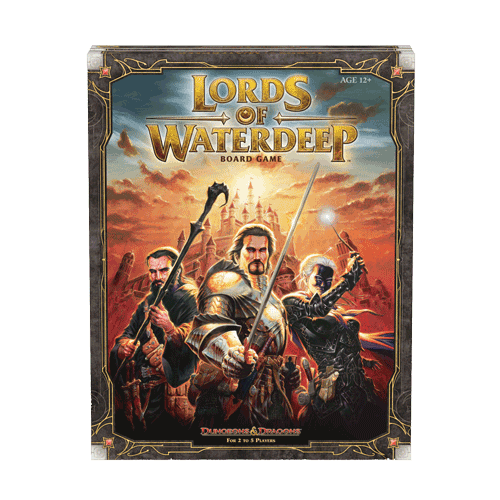 Lords Of Waterdeep is set over eight rounds of play and each round sees players taking it in turns to assign their agents to key parts of the city in order to recruit thieves, fighters, clerics and mages. Only one agent can inhabit one area though, so you’ll really need to plan and bluff in order to always hits the areas you want to. Players can also earn additional resources, by again visiting key areas. Head to Aurora’s Realm Shop for example and you’ll net yourself 4 coins, move to Castle Warterdeep and you’ll not only earn the opportunity to start first (and go to that much needed city space before anyone else) but also earn an intrigue card. Then there is the important Cliffwatch Inn which allows you to accept quests. These are especially important as they are the main resource for victory points, but can also grant additional in-game bonuses that range from recruiting additional adventurers when certain bonuses are met, to scoring additional points when you complete certain types of quests (the quests themselves are Arcada, Piety, Skullduggery, Warfare and Commerce). Up to three agents can visit the inn, and there’s a handy option to reset the entire quest board if you don’t see anything you like. You can only complete one quest per round and you’ll need a specific number of adventurers before you can successfully complete them. Intrigue cards are another important addition, as they allow you to subtly manipulate the game whenever you visit Waterdeep Harbor. An intrigue card might allow you to recruit new adventurers, steal resources from another player, or give your opponents mandatory quests, which they must complete before anything else. Another nice touch is that once all agents have been assigned, the agents of Waterdeep Harbor are reassigned as well, meaning that it’s not a wasted turn to go there. While there are many buildings that players can visit on the main board, it’s also possible to build more by visiting the Builder’s Hall. Whoever lands on this area gets to take one of the face-up buildings on display and add it to one of the nine available areas around the city. This property grants stronger bonuses than those found on the main board, including an ambassador who lets you immediately play first before anyone else makes their move to The Three Pearls, which allows you to trade in two random adventuers for three adventurers that will be more useful to you. Players also receive a token bonus (from money and gold to adventurers) whenever their building is used, meaning they can become a very valuable resource early on in the game if particularly high-yielding cards show up. There are more advanced buildings than spaces on the board (twneth three in fact) meaning no two games will ever be the same. At the end of the eighth round the lords are revealed quests points are totted up and players get additional victory points for every two gold pieces they own and for every adventurer they still control. Lords Of Waterdeep is easily the best new game I’ve played this year, even if it is very heavily-based on Caylus. It’s very fast-paced (games take around 40 minutes) is extremely easy to learn and has truly glorious componants. It scales equally well regardless of how many players are taking part and its theme is loose enough that it won’t alienate players who have never played a D&D game before. 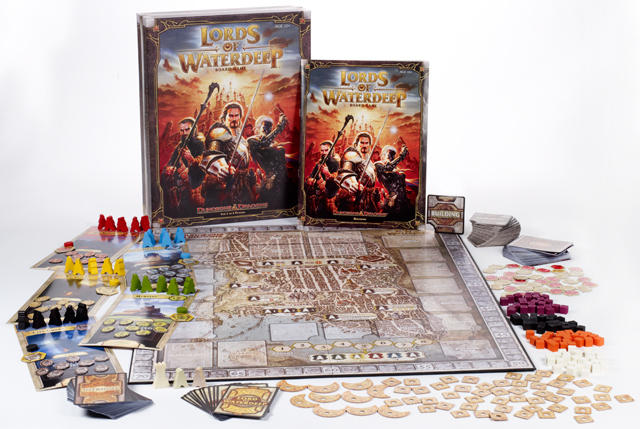 Lords Of Waterdeep is available to buy now from Board Game Guru and is for 2-5 players. 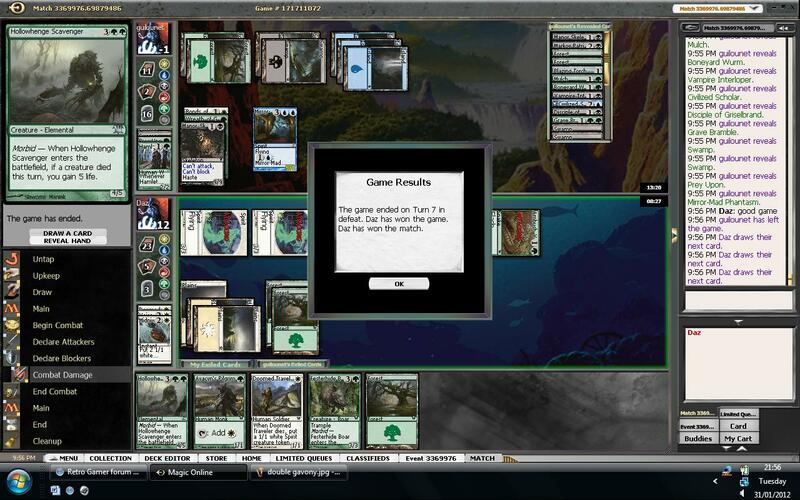 I like playing Magic: The Gathering online. I’m not very good at it though. In a perfect world I’d be constantly making finals, but it happens to me far too often. Still, I get a lot of enjoyment out of Magic, and Innistrad has been particularly good fun. 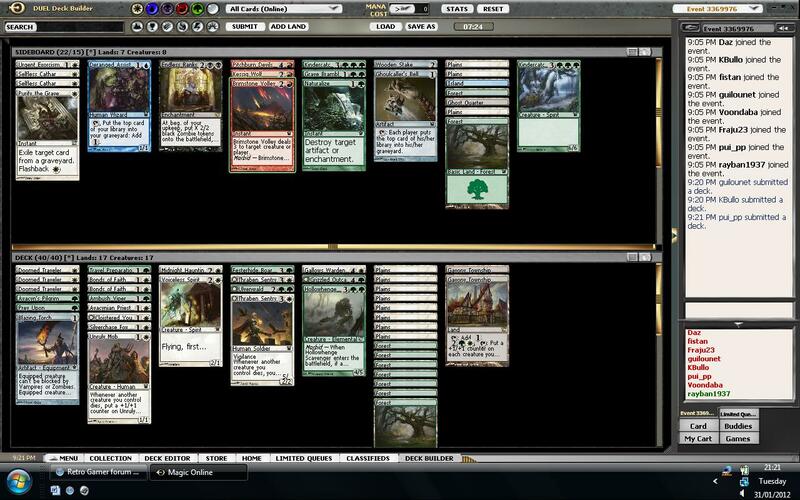 So anyhoo, I decided to jump into a 4/3/2/2, as I find swiss drafts to be a complete lack of challenge. My very first pick was Gavony Township, a land which puts +1/+1 counters on all your creatures. Now this is a pretty good card, so I decided to go for the green/white archtype which is extremely popular. It was going pretty well too, and I eventually managed to amass 3 doomed travellers, a couple of pilgrims (for mana) a midnight haunting (token generator) and a few over tasty cards. Most surprising of all was a second Gavony Township. I had a fast deck with low, but decent removal. The deck itself looked like this. My first opponent was a blue-green player with a splash of black. He had some great cards including Mirror Mad Phantasm, tribute to hungers and a few other bits and bobs. He played well, and quickly took the first game. Fortunately, I was able to claw back the second 2 games due to a small smidgen of luck on my part and a couple of silly players by my opponent (he managed to effectively deck himself game 2). I’ll be covering the awesome Thunderstone soon because it’s brilliant. In the meantime, here’s my daughter Emily explaining why she enjoys playing this excellent deck builder from AEG. I’ve heard this quote countless times over the last year, despite having little knowledge of the book it came from. HBO’s adaptation of A Game Of Thrones changed all that, and I’m now a fervent fan of George R.R. Martin’s work, even if I’ve not read all the books yet. 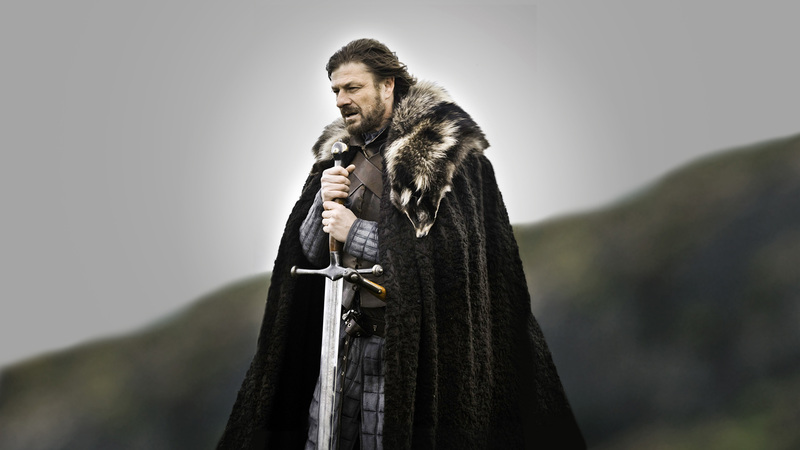 But don’t worry, I’m not here to talk about the novels and excellent TV adaptation. No I’m here to reveal the numerous board games that are available, and have been available for quite some time now. Please note that these are only basic overviews, I will go into more detail in later reviews. I just felt that if you’re new to the series like me, you might want to know what sort of stuff to start looking for. The most interesting aspect of this game is that it’s actually an adaptation of an older collectible card game that Fantasy Flight Games first released in 2002. Fantasy Flight converted it over to the LCG format in 2008 and it has stayed this way ever since. It’s been a big success for Fantasy Flight, and while it’s perfectly possible to play the game straight out of the box via a very balanced base set, many like to buy the monthly expansions that enable them to constantly upgrade and improve their decks. In the core set, it’s played between 2-4 players, but it’s definitely built for a full group of players. Players take on the role of 4 of the major house: Stark, Lannister, Baratheon and Targaryen and must attempt to seize 15 power points. What’s interesting here is that there are 3 distinct types of challenges: Military, Intrigue and Power, which can be played to give you an edge over your opponents and earn different rewards. It’s a slick, beautifully presented game, rich in theme and dripping with flavour. I’ve literally just got my hands on a copy of this, so can’t really tell you to much about it at the moment. What I do know is that it’s a 2nd Edition of the game that was first released in 2003. It’s infamous for taking an extremely long time to play (typically around the 4 hour mark) and for being an incredibly back-stabby game. As I like games like this, I’m quite looking forward to getting stuck into it. 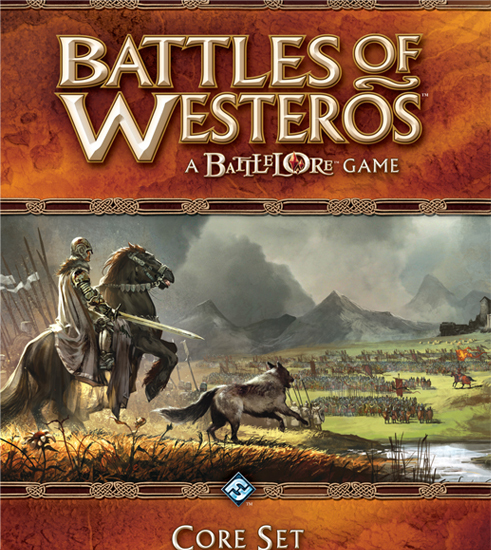 It featured two expansions: A Clash Of Kings and A Storm Of Swords, and elements from both expansions are included in the new revision. 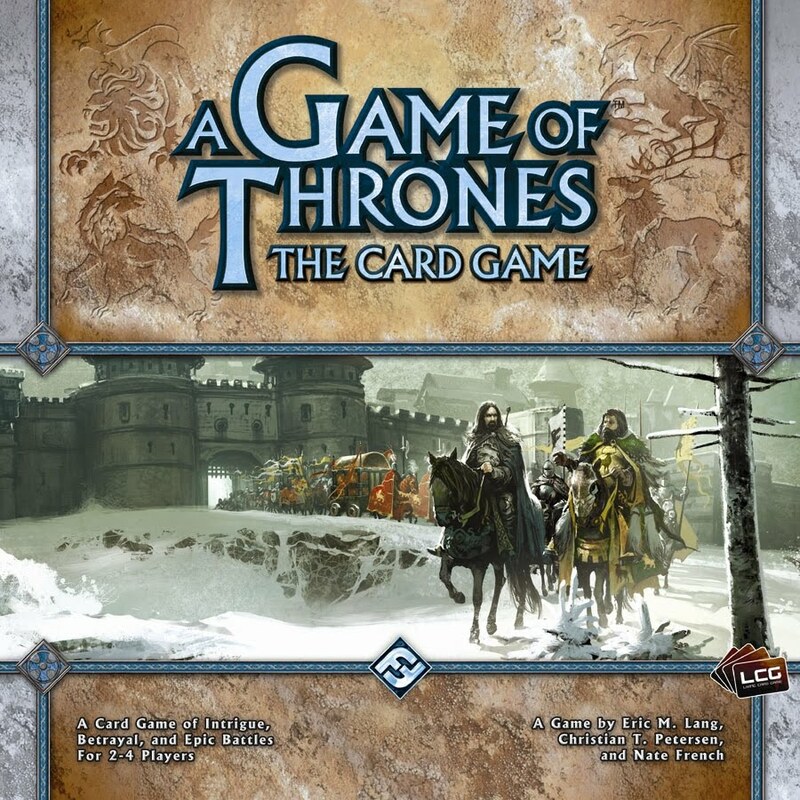 The game takes place over 10 turns and sees players amassing armies and trying to seize control of Westeros. From what I’ve seen of the instructions it’s a fairly complicated game, but it does appear to have a lot of potential for intrigue and political might. One thing I like about the card game is that it’s very swingy, with games often going several ways before a winner is determined, and from what a friend has told me, the board game is very similar. Expect a review very soon. Many battles take place in the novels, so it should come as no surprise to learn that there is a war game that takes place in George R.R. Martin’s fantastical world. Unlike the other games, it’s designed from the off for just 2 players, and sees them pitting rival houses against each other on the battlefield. 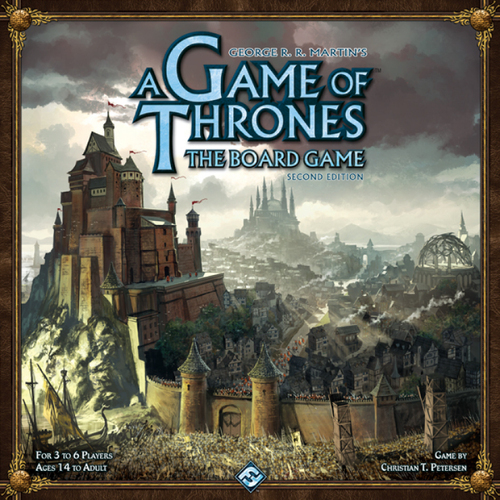 The game comes with a huge amount of playing figures and is far quicker to play than the other A Game Of Thrones titles, with a game typically lasting around 45 minutes. I admittedly know very little about this last game, but it does look very interesting. Needless to say I’ll be hopefully picking up a copy very, very soon. I appreciate that these are only brief intros (and in the case of Battles Of Westeros, rather flimsy) but hopefully they’ll inspire you to at least check the games out. Here’s a vide review of Cyclades to complement the written review on the blog. Enjoy.